Effective Listening to Increase Team Productivity and Collaboration is the first webinar in a three-part EXP Speaker Series: Team Leadership Essentials, designed to enhance your leadership skills in the areas of communication, productivity, collaboration, accountability, and performance. Learn the importance of listening to effective team productivity and collaboration. Communication is critical to any relationship and the most fundamental of all the soft skills. It is the most important of the six key indicators of highly functioning teams. IDCEC Approval Pending; 0.1 CEU Note: ASID will report CEUs earned to IDCEC on your behalf. Access period for webinar recording: One year from live webinar start time. Over the past 30 years, Renée Safrata has helped over 250 companies and 2000 business executives throughout North America connect and adopt new behaviors to become confident members of highly functioning teams. She firmly believes that this philosophy of connection is what ultimately drives productivity and contributes to company results. After 11 years in the interior design business, Renée shifted careers to consult to CEOs, COOs, executive management teams, senior teams, associations, and entrepreneurs to build more focused, engaged, and results-oriented collaborative teams. She is the founder and owner of Vivo Team Development, an HR Technology company delivering analytics and digital performance management solutions to activate talent and empower employees. Learn how you as a designer can influence the built environment to better support and assist families affected by the trauma of homelessness. This course, supported by the ASID Foundation Irene Winifred Eno Grant, will help you understand the perspective of families experiencing homelessness, offering insight into their needs and concerns when entering shelters or other emergency housing situations. You’ll then learn how you as a designer can influence the built environment in those settings to better support and assist families affected by the trauma of homelessness. Understand the current state of homelessness in the United States. Describe the mindset of parents and children experiencing homelessness and their priorities and concerns. Identify fundamental qualities that designers can employ in the built environment to effectively assist families experiencing homelessness. Describe specific environmental design strategies to accommodate families in trauma who are living in shelters or permanent residences. 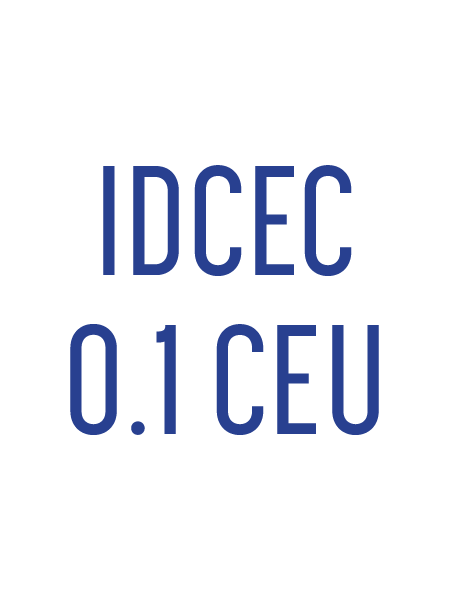 IDCEC Course Number: CC-106122; 0.1 CEU Note: ASID will report CEUs earned to IDCEC on your behalf. Jill Pable is a practicing interior designer who took on the challenge of academia in 2000 and has been a professor at Florida State University since 2005. She recently founded Design Resources for Homelessness, Inc., an online nonprofit that strives to address the homelessness issue by providing resources for designers to create quality facilities for persons in need. This project was funded in part by a grant from the ASID Foundation. Pable has been an active member of IDEC, serving as Past National President, and her ASID involvement has been with students and focus groups at the national level. Her leadership perspective is research-based and inclusive. She is currently an at-large director on ASID’s national board of directors. Feedback/Feedforward: Why Feedback Alone Doesn’t Work & What To Do About It is the second webinar in a three-part EXP Speaker Series: Team Leadership Essentials, designed to enhance your leadership skills in the areas of communication, productivity, collaboration, accountability, and performance. Discover the power of the three “F” words to inspire and engage people to improve their performance. Feedback alone doesn’t work. Research tells us that about one-third of the time feedback leads to momentary performance improvement; one-third of the time it results in nothing; and in one-third of cases, leads to worsening performance. This introduction will provide the background for designers to lead the conversation with their clients about the benefits of healthy interior spaces and how design strategies can impact health outcomes. Building owners and occupants are now focusing on the built environment impacts human health, and the evidence is clear. This introduction module will provide the background for designers to lead the conversation with their clients about the benefits of healthy interior spaces and how design strategies can impact health outcomes. Identify ways in which interior spaces, buildings, and exterior spaces can affect human health. Define the components of health: physical health, mental health, and wellness. Describe benefits of healthier homes, offices, schools, and healthcare facilities. Describe key elements of the Health + Wellness Protocols. IDCEC Course Number: CC-105812; 0.1 CEU | HSW Note: ASID will report CEUs earned to IDCEC on your behalf. This third Health + Wellness Protocols module will give you an overview of the processes and tools needed to select healthier materials. Today, clients are becoming increasingly aware of the health impacts of their homes and buildings. They want to be confident that their interior spaces support the health of the people who live and work in them. Clients want materials that are safe and sustainable, and that meet the health standards as certified by credible third-party organizations. They rely on designers and architects for advice on navigating this complex field. Identify the substances of concern found in building materials and their associated health impacts. Identify methods for evaluating materials and define the concepts of hazard, exposure, toxicity and risk. Describe healthy material considerations and strategies for their selection. 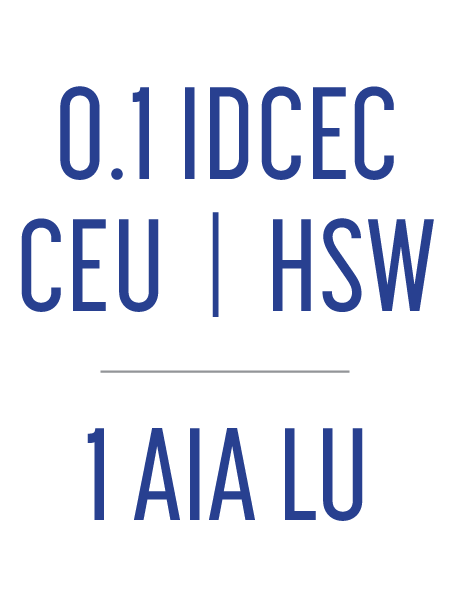 IDCEC Course Number: CC-105814; 0.1 CEU | HSW Note: ASID will report CEUs earned to IDCEC on your behalf. Access to good air, light and water is essential to human health. So is access to a supportive built environment. Components make up a building’s envelope and interior elements, vital parts of a building’s major systems, and the technologies that “connect” us and assist occupants in operating the space in an efficient, healthy manner. In this final Health + Wellness Protocols module, we will examine building components that shape our interior environments and how designers can select components to improve the air we breathe, the water we drink and our access to sunlight and views, which are the hallmarks of the general health and safety of interior spaces. Identify building envelope components at the building scale and interior scale that support healthy indoor environments. Describe how air moves through a building and methods to improve indoor air quality. Describe strategies to improve the positive impacts of light quality in an interior space. Identify strategies to improve water quality and use water more efficiently. IDCEC Course Number: CC-105815; 0.1 CEU | HSW Note: ASID will report CEUs earned to IDCEC on your behalf. This second Health + Wellness Protocols module will introduce interior designers and architects to the baseline information necessary to understand this growing health and wellness approach to design practice. This fourth Health + Wellness Protocols module will explore products that enhance the health of a space, including furnishings, lighting fixtures, plumbing fixtures, appliances and cleaning products. Emerging research reveals an alarming trend: people’s health and sense of well-being are in decline throughout the world. This global issue poses a significant risk for employers: poor health and well-being among workers reduces performance and productivity. For employers that provide healthcare benefits, it also contributes to escalating cost burdens. Nearly 70 percent of health care costs are due to preventable conditions, and new research confirms that spending long hours sitting down while commuting and working can play a significant role in the development of chronic disease. More than ever, worker well-being is a good business for designers. In this fourth Health + Wellness Protocols module, we will explore products that enhance the health of a space, including furnishings, lighting fixtures, plumbing fixtures, appliances and cleaning products. Recognize how furnishings can support human health and wellness through active design, ergonomic and stress reducing strategies. Identify ways to use and optimize lighting products to promote comfortable work environments. Discover how to select plumbing fixtures and appliances for their sustainable, assistive and inclusive features. Communicate strategies to implement comprehensive cleaning protocols and use cleaning products to support clean, healthy interiors. 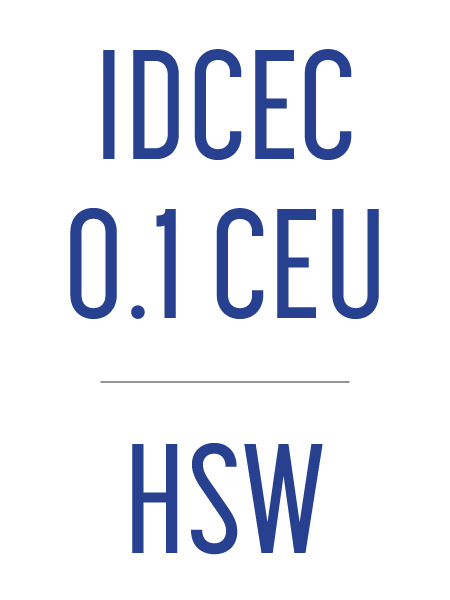 IDCEC Course Number: CC-105811; 0.1 CEU | HSW Note: ASID will report CEUs earned to IDCEC on your behalf. This session will introduce interior designers, architects, and design students to expert panelists across government, industry, design, technology, and standards, who share their field perspectives on this issue. This session will introduce interior designers, architects, and design students to expert panelists across government, industry, design, technology, and standards, who share their field perspectives on this issue. This seminar was recorded as part of the 2015 Impact Summit. Central discussion: Most workplace accidents are preventable and can be traced to employee error. When employees are educated and motivated to improve their health, they are less likely to cause an accident at work, or to be involved in one. Likewise, safety is negatively affected by employees who are less than healthy, due to a wide variety of issues, such as: lack of sleep, high stress, reduced physical fitness, working with an illness or injury, inattention and distraction, and inadequate indoor environmental quality. Consider the challenges and opportunities in current Health Safety and Welfare codes supporting human health and wellness in the built environment. Explore pathways for technology and design to increase employee participation in safety initiatives, while further integrating wellness initiatives. Compare how higher education, credentialing and licensing requirements will be impacted by the emerging changes to design practice due to heightened focus on health and wellness. Recognize cross-sector terminology related to health and wellness oriented design. IDCEC Course Number: CC-105683R1; 0.1 CEU | HSW Note: ASID will report CEUs earned to IDCEC on your behalf. Learn key questions and considerations to specify healthy materials for your projects, including how to recognize materials that could be harmful to human health and how to find alternatives. After taking this course, you’ll be able to recognize materials that could be harmful to human health, and know how to find alternatives when specifying.Dr. Andrew Dent of Material ConneXion will walk you through scenarios to illustrate areas of concern and provide examples of situations where healthful alternatives are necessary. You’ll learn key questions to ask and how to navigate ratings and points systems to evaluate materials’ impact on human health. 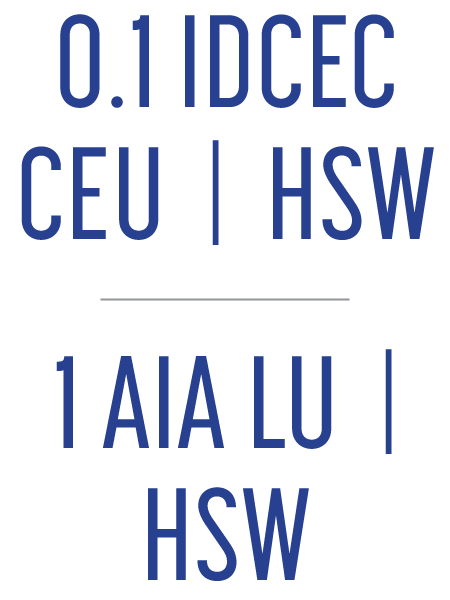 IDCEC Course Number: CC-108108; 0.1 CEU | HSW Note: ASID will report CEUs earned to IDCEC on your behalf. Dr. Andrew Dent is Executive Vice President of Research at Material ConneXion, and Chief Material Scientist at SANDOW. He plays a key role in the expansion of Material ConneXion’s technical knowledge base. His research directs the implementation of consulting projects and the selection of innovative, sustainable and advanced materials to Material ConneXion’s library, which currently houses over 8,000 material samples. Since joining Material Connexion, Dr. Dent has helped hundreds of clients—from Whirlpool and Adidas to BMW and Procter & Gamble—develop or improve their products through the use of innovative materials. A leading expert on sustainable materials, his insight has played an important part in creating a new generation of more sustainable products. He is a frequent speaker on sustainable and innovative material strategies and is the co-author of the Material Innovation books series, which, to date, includes Material Innovation: Architecture, Material Innovation: Product Design and Material Innovation: Packaging Design. Dr. Dent has also contributed to many magazines including Business Week, Fast Company and the Financial Times.